An exquisite holistic wedding image consists of the harmony of the wedding dress and accessories. A special place among them is occupied by a veil – a symbol of purity and femininity, traditionally considered a guardian of the evil eye. How to choose the right wedding veil? You will find a detailed answer in our article. Remember – the veil should be purchased after or one-time with the dress because the choice of the basic outfit depends on what style and length should be an accessory. Ideally, if a certain option is already offered to the dress. As a rule, they are perfectly combined due to similar fabrics, color, and decor. For example, in models POLLARD DEMETRA, UMA and SIRENA, the veil repeats the elegant lacy ornament, a thin pattern of sequins along the edge, small peas, the texture of the material, present in the dressing of the dresses. Important! Do not choose to be bundled with white along with a veil of ivory. Such a decision can be highly disharmonized in the photo. If the wedding ceremony is thematic – colored, then it is permissible to use bright shades – green, orange, blue and others. When choosing a veil, first of all, you need to start from the style and finish of the wedding dress. The model captivates the effectiveness of cut and luxury decor? Fatou for her should choose a quieter, not distract from the beauty of the dress. A strict laconic outfit will complement the voluminous air accessory. In the classic style, a luxurious veil, complemented by a multitude of details, is suitable. 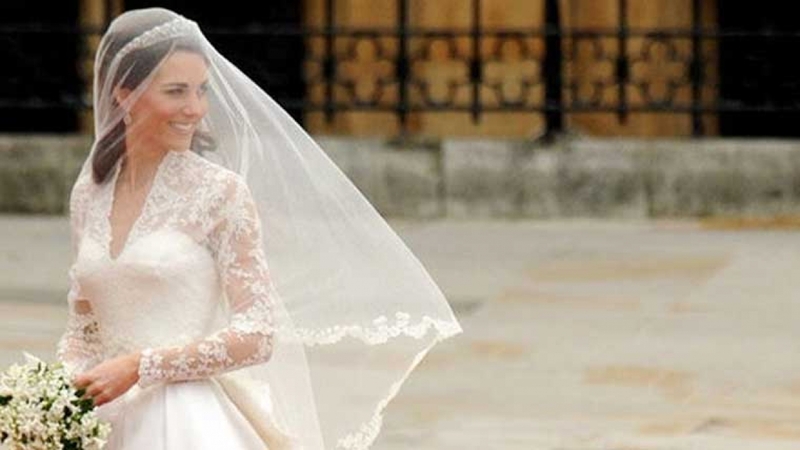 For short wedding dresses, a long fancy veil is inappropriate. To design outfits do not choose a modest short addition. If you want to show an exquisite decor, stop at a translucent version. 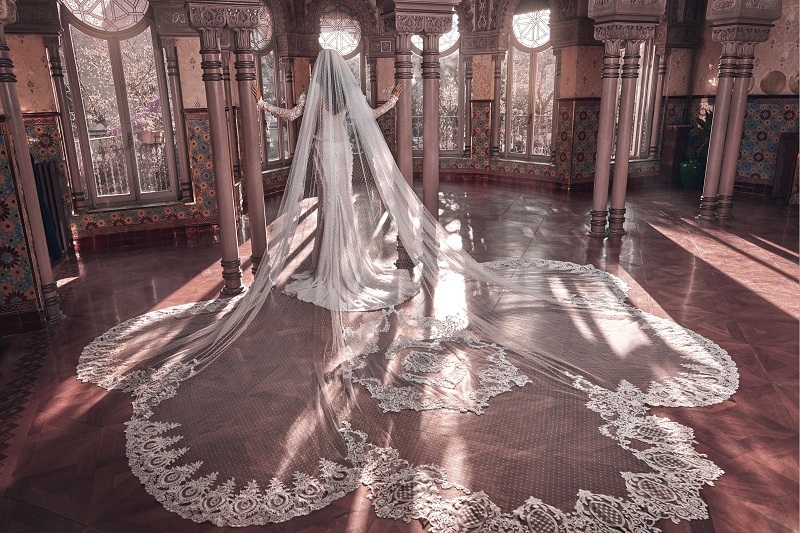 Fata “cathedral” – a luxurious model in the form of a train perfectly complements the outfit for the wedding, it will fit the dress on the floor. Standard length does not exceed 3.5 m, but if desired, you can order any length. For example, in Siberia, the wedding agency stitched a bridal veil 2 km long. Fat “chapel” perfectly complements the classic outfit, exceeding the length of the skirt by at least 15-20 cm. Shorter than the “cathedral” (up to 2.6 m), it will also cope with the role of the trail for the wedding image. Fata “waltz” – an excellent choice for dresses straight cut without a loop. It ends level with the hem of the skirt, and has several layers, giving touching, fragility, and lightness to the image. In the collections of our salon, wedding dresses are presented, complemented by a long elegant veil. This is also a translucent tenderness trimmed with lace in an accessory for the IDE TOREZ VISON dress, and the POLLARD MUSE aerial model of the “chapel” type. 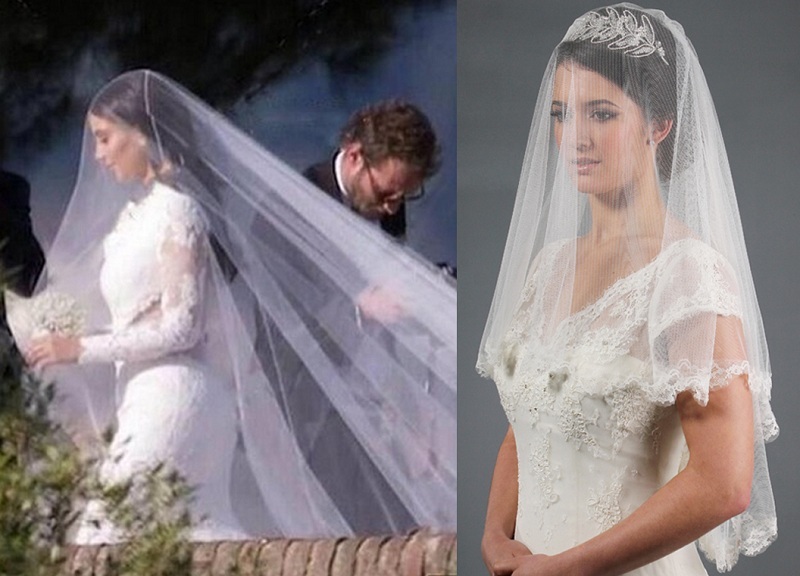 “Mantilla” – Spanish version of the veil, characterized by an unusual way of fastening. Like a handkerchief, she is thrown over the head of the bride and fixed with invisibility, so it gives the impression that she does not hold anything. Mantilla can be decorated on the edge of lace or embroidery, as in the outfit LORANGE 1676. Openwork festoons along the edge of the veil echo the motif on the dress, emphasizing the integrity of the kit. It gives the image purity, mystery and modesty look good with simple hairstyles and smooth styling. Fata “pouf” also differs in its originality. It is collected on the head of the bride in one place, enveloping the figure with light folds. Thrown back, forms two almost identical layers. The model is combined with any wedding dress, it looks very easy, gently and exquisitely. It is such an addition is present in the model LORANGE 1680, where a fresh and lush style emphasizes the tenderness of tulle. To unusual short variants of a veil concern “piratka”, “veil”, “blush”. “Piratka” – the original lace accessory, also called “Juliet’s cap”. He will perfectly suit dresses in the style of art deco, extravagant models will give a note of romance and unusual image. For such a veil you need a short haircut, loose curls. “Veil” will fit perfectly into the retro-image, but also be able to shade any other model. When choosing, pay attention to the finish. To the luxuriously decorated dresses, a modest veil without patterns will suit, and a strict classic will be diluted with an accessory with embroidery, inlaid with stones and rhinestones. “Blush” – an elegant single-layer veil, covering the upper part of the face, and after the ceremony leaning back. Very popular removable model, but then you need to take care of the aesthetics of the hairstyle with or without decoration. Of particular importance is the length of the veil. Determine suitably can be experienced by trying on with the chosen wedding dress different options. Remember, the veil should not cover the compositional accents on the dress. A short veil will give an opportunity to demonstrate decor and decorations in the neck area. For example, in the DARIA KARLOS MASADA model, a small size opens luxurious earrings. Also among the jewelry can be a necklace, a velvet or lace collar-stand, embroidered with beads. The length of the shoulders harmoniously looks with fitting dresses in the floor or short decollete models. The style up to the elbow can be considered suitable for any outfits, but a combination with a magnificent cut is especially successful. Fat to the fingertips is the most versatile kind. In the model, LORANGE 1616 veil to the middle of the palm repeats not only the material but also the color of the dress, while its laconism emphasizes the effective floral decor. Long models, for example, LORANGE VELIANANA from a translucent tulle, can end on a level with the hem of the dress or go to a refined train. The shape of the face. Chubby brides wishing to hide their cheeks can choose not a very luxurious veil from a dense, form-stable fabric that slightly covers the face. A square shape with sharp cheek lines will make the light veil of cascading or round cut to shoulder length more harmonious. A narrow, elongated face visually balances a wide veil, surrounding it with a gentle cloud. Brides with an oval face shape are not limited in choice. Hairstyle. It will affect the style, method of attachment, length. The material of manufacture. Two kinds of tulle are often used. The soft one lies down with gentle folds and often goes to a double-layer veil that covers the face. In the model, LORANGE VIDANA light translucency adds charm and charm to the wedding dress “princess”, without interfering with the decoration of the bodice and tiny sleeves. 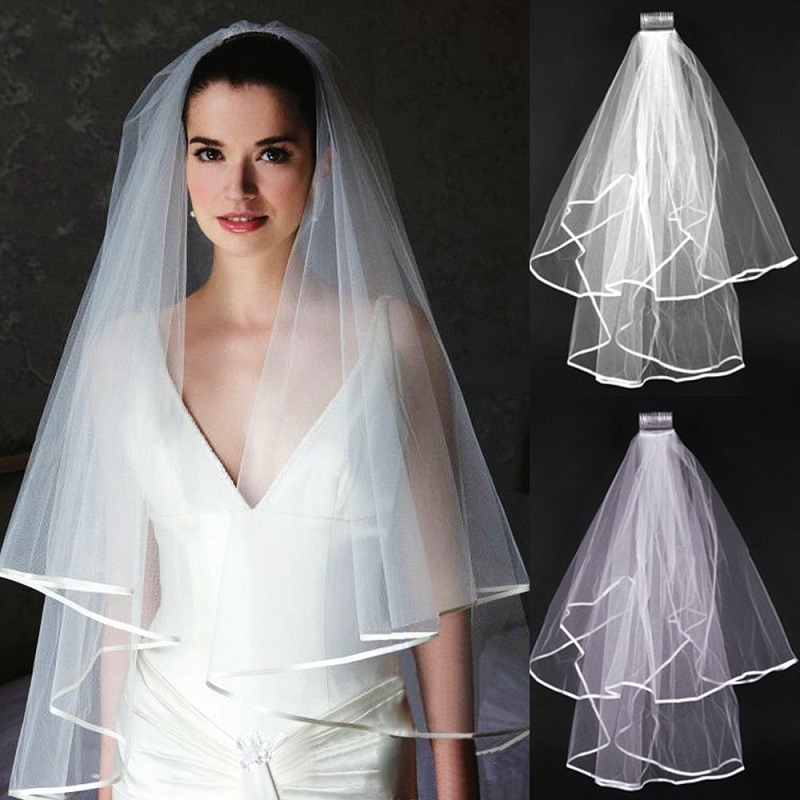 The rigid tulle is more form-stable, it makes the accessory lush, airy and suitable for creating a solemn image. The lace veil looks elegantly – its delicate pattern perfectly harmonizes with a noble satin, or a dress made of chiffon or taffeta, as in the LORANGE BELICA model. The scalloped edge of the mantilla is similar to the finish of the skirt. The motifs of lace ornaments may vary, but must necessarily be in harmony. Body and proportions. With the help of a good shape, you can transform a shape. So, to hide the wide hips, fancy suits up to elbow length. To correct the growth of miniature brides you need an accessory of short or medium length in one layer, high – long, with a wide strip of decor on the bottom. Thin girls will look good with lush models or veil to the hips, decorated with embroidery or lace, and for long-haired brides, a long flowing veil is preferred, without multilayered and active decor. Fat “waltz” can give proportions slenderness and grace. Finishing. The decor should be combined with decorations on the dress, whether it be lace edgings, rhinestones, and stones, embroidery. The amount of decor should not be argued about luxury with the finishing of the basic outfit. Comfort. The veil should not be strongly crumpled, clinging to dresses or interfering with movements. It should be an organic continuation of the outfit, only shading the beauty of the image of the bride. 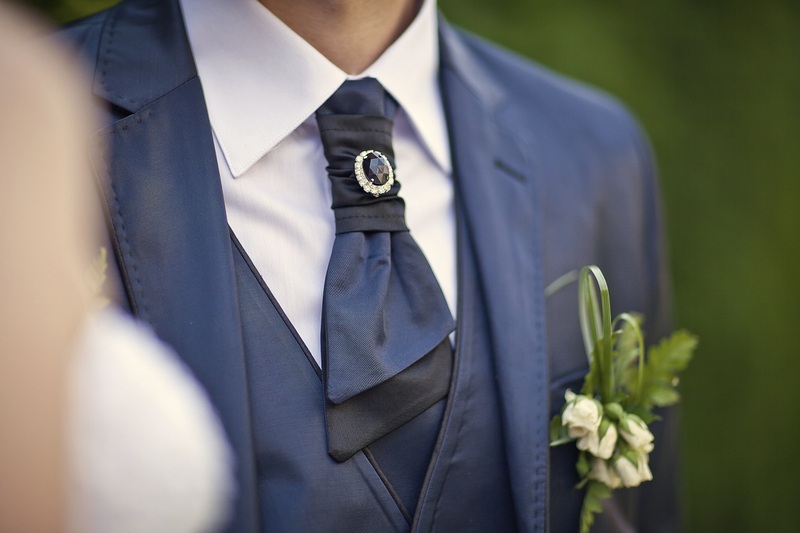 A graceful accessory will give the wedding image completeness, mystery, charm, and grandeur. In our salon, you can always find a spectacular and elegant outfit and accessories, including suitable for style, materials, and decor of the veil for a wedding dress.